5793 labyrinths found. Showing 1961-1980. Sorted by country, state, city, then zip/postal code. Located in the meadow on the plateau behind the meeting house. Go down the driveway to the large turn around (where we plan to install a full sized Chartres replica soon), through the short gate and down the steep pathway leading around behind the campus. Follow the path around until you see it. Parking is available (for a fee, if you come other than for Sunday services) in either the church lot or in the UCSD Hospital garage next door. Sunday: 8am to dusk - Weekdays: 10 am to 4 pm - Closed Saturdays as no church staff on duty. This transitions-labyrinth lies just above a neighborhood canyon in San Diego. 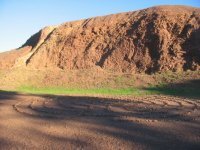 The labyrinth is 35 feet in diameter, made of earth, sand and bricks, has 9 circuits and was built with love by local volunteers. Can be accessed through City canyon. In Mission Valley near I-8 and Texas Street. From Interstate 5 take Clairemont Drive east. Continue up the hill to Burgener. Turn right and continue on Burgener to the corner of Milton. Labyrinth is in an outdoor courtyard. 32* 45' 44.5" N° Lat. ; 117* 04' 51.50"° Long. Near Qualcomm Stadium at 8/15. Up the hill on Mission Village Drive, turn left at Shawn, immediate left on Melbourne Drive. two miles to Cypress Canyon Rd turn left 3/4 mile to Blue Cypress Dr.
Close the border with Mexico, 5 minutes from the beach. Between Saturn and Thermal Ave. Situated outside the front of the cathedral. Weekdays 7 a.m. to 5:15 p.m.
Saturdays, Sundays: 8 a.m. to 5:15 p.m.
On Sundays and holidays, there may be special events that cause the indoor labyrinth to be inaccessible to the public. 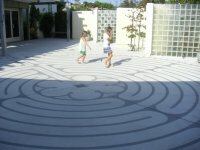 The labyrinth is located on an outdoor living church that was once St. Pualus Cathedral. The cathedral burned in 1995 and the church has consecrated the land as an outdoor living church without the dogma. We made the labyrinth from the bricks of the foundation. 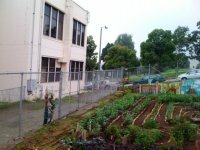 The rest of the lot is farm and we grow and give away thousands of pounds of produce while teaching people how to grow their own food :). 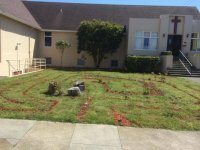 Public access is on Wednesdays & Saturdays from 10 am - 2 pm; please contact Kris Iversen as she can give the history and purpose - 415-203-2360 and will meet someone whenever they wish to see our lovely labyrinth made of medicinal herbs, fava beans and flowers right now. Kris Iversen is authorized to show the labyrinth on behalf of The Free Farm by appointment. This labyrinth began as a 3-Circuit Classical labyrinth in May 2008 made of stones from Bernal Hill. Over time, people have added stones, paths, and turns. Park on the south side of Bernal Heights Boulevard, near Anderson, and walk west to the quarry area. Add a few stones when you walk it. Started out as a classical labyrinth, now a hybrid maze. Located in McLaren Park, entrance near 266 John Shelly Drive, then about 100 feet up a dirt path from the road, on top of a small hill. The park is always open, but John Shelley Drive is closed at night. 37 deg. 43' 11° Lat. ; 122 deg. 25' 13° Long. The church is located between 23rd and 24th Streets, between Chruch and Castro Streets. It is near the J streetcar line, and the #24 and #48 Muni lines. The labyrinth is upstairs. 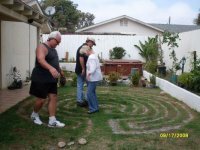 Labyrinth Walks take place monthly on the third Wednesday from 6:00pm-7:00pm, also available when building is open and sanctuary is not in use. Located at the corner of Jackson and Fillmore. Served by Muni lines #22 and #3. Labyrinth is located in the lower level of the Sanctuary. This labyrinth is made of drought resistant succulents and is outdoors. So, it can be accessed anytime during daylight hours.